History: In 1900, a reservoir was needed to maintain a safe and adequate water supply due to a problem with contaminated wells. City officials chose a site that was a parcel of land that had been purchased from Andrew Hamilton in 1880. 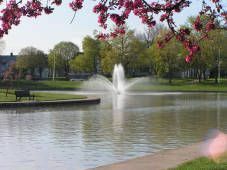 Early in the 1960s, a new water filtration plant was built, and the now obsolete reservoir was partially demolished and integrated into the famous fifty-foot hill that has come to symbolize Reservoir Park. 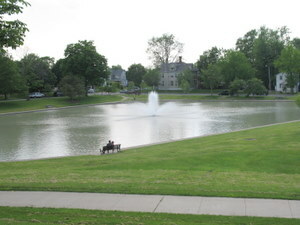 In 2009, the Park was renamed Ivan Lebamoff Reservoir Park after former Mayor Lebamoff (1972-1975) who was also on the City Park Board. 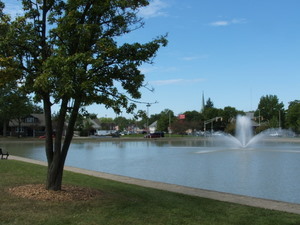 Lebamoff helped find funding to rebuild the deteriorating Reservoir Park in the mid 1970s and transferred the property from City Utilities to the Parks and Recreation Department. Cooper Center offers year-round youth programming. 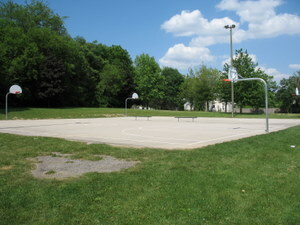 Basketball courts are available for use at the edge of the park. 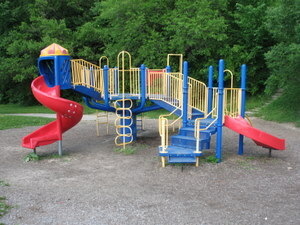 A playground with multiple slides is available for children. 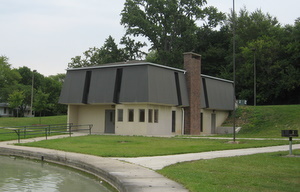 Fishing is allowed at Reservoir Park with appropriate licenses.